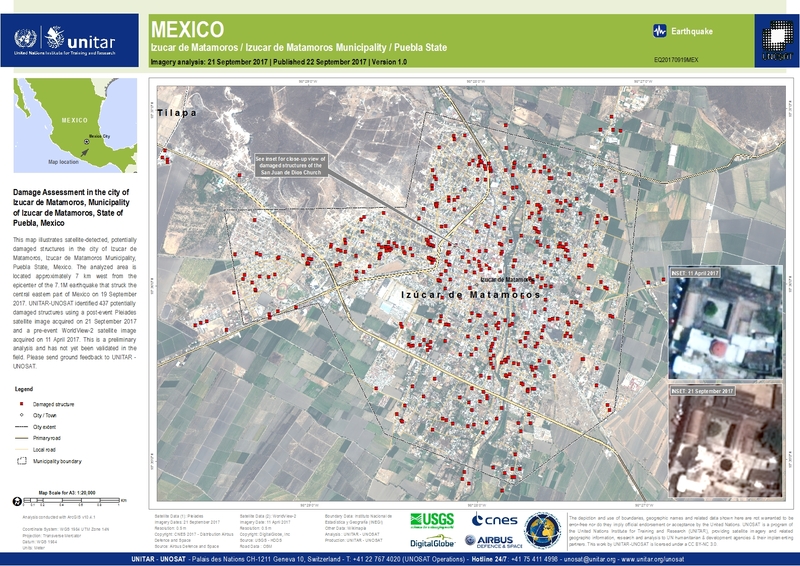 This map illustrates satellite-detected, potentially damaged structures in the city of Izucar de Matamoros, Izucar de Matamoros Municipality, Puebla State, Mexico. The analyzed area is located approximately 7 km west from the epicenter of the 7.1M earthquake that struck the central eastern part of Mexico on 19 September 2017. UNITAR-UNOSAT identified 437 potentially damaged structures using a post-event Pleiades satellite image acquired on 21 September 2017 and a pre-event WorldView-2 satellite image acquired on 11 April 2017. This is a preliminary analysis and has not yet been validated in the field. Please send ground feedback to UNITAR - UNOSAT.